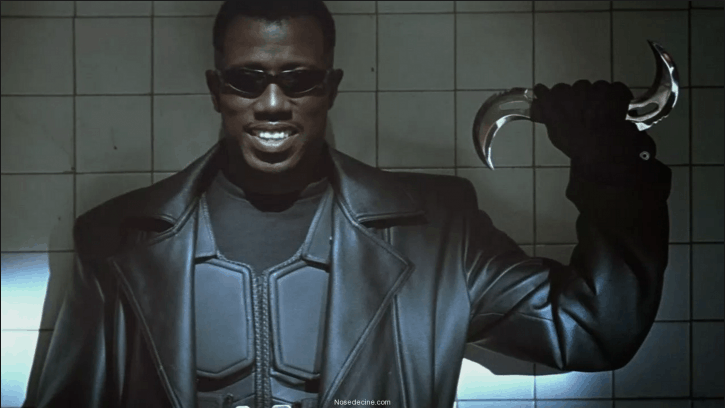 Stephen Norrington’s 1998 adaptation of the comic book character Blade was one of the first films in the growing wave of modern-day comic book films which would eventually be pushed into the medium as we know it today in 2000 when Bryan Singer’s X-Men was released. The film which starred Wesley Snipes as the iconic vampire hunter spawned two more sequels in Guillermo Del Toro’s Blade II and David S. Goyer’s Blade: Trinity – both of which Snipes reprised his role for. Although those films were released by New Line Cinema, Marvel Studios earned the rights back in 2011. In 2013, THR reported that a script was in Marvel’s possession for a potential feature. It had also been reported in 2015 that Wesley Snipes had been in talks to reprise his character for the Marvel Cinematic Universe. Obviously, nothing official has come out as of late, and the plans at the moment don’t seem to have another Blade project in the cards – be it a new feature film or even a Netflix series. But it looks like Wesley Snipes is still lobbying for a chance to portray the Daywalker again, for he just recently voiced his hopes via Twitter. How would you prefer to see Blade in the MCU? Would you prefer a big screen adventure or a TV series? Sound off in the comments below. Maybe this would have happened already if he weren’t such a nightmare on the last Blade film. We know he’s down for TV given the quickly cancelled The Player, so I say Blade should definitely be in there with Punisher on the next wave of Netflix and Snipes could definitely reprise. Do at least 4 series a year, Netflix! Agree. But not with Snipes. “my room mate Lori Is getting paid on the internet $98/hr”…..!tc261utwo days ago grey MacLaren. P1 I bought after earning 18,512 Dollars..it was my previous month’s payout..just a little over.17k Dollars Last month..3-5 hours job a day…with weekly payouts..it’s realy the simplest. job I have ever Do.. I Joined This 7 months. ago. and now making over hourly. 87 Dollars…Learn. More right Here !tc261u:➽:➽:.➽.➽.➽.➽ http://GlobalSuperJobsReportsEmploymentsKnowledgeGetPay-Hour$98…. .★★★★★★★★★★★★★★★★★★★★★★★★★★★★★★★★★★★★★★★★★★★★★★★★★★★★::::::!tc261u….,…. I’d rather see white men can’t jump 2 than Blade 4 with Snipes. As much as I loved the original, I don’t want the MCU to tie up to the same continuity as those movies. I’m down for Snipes in another MCU role, but not Blade. I dont think the MCU is ready to invite Vampires into the mix. I say sell (or share) it to Fox and let them run with it. I think Blade would fit better in the coming mature X-Men Universe movies. He’d be a fun addition to X-Force. I think Id rather see a new actor even though it would make for a great Deadpool joke with Snipes and Reynolds. Blade is a great character and I’d love to see Marvel do something with that. Just no, no, no, no Wesley Snipes.